First of all I have to report that despite all my good intentions to post a blog each fortnight, I’ve sadly failed. Sometimes I think I need to plan my time better and I do try. When I say that to Ken, he nods his head knowingly; of course he’s heard it all before. No matter how carefully an intention or project is planned, something may still cause delay. I think the saying “The best made plans of mice and men often go astray” (adapted from a line in “To a Mouse” by Robert Burns) is very appropriate. This got me to thinking about the best way to prioritise my time so I trawled through various blogs on the net and came across the following very good advice. It’s certainly worth a read. The moment we admit to ourselves that we’re trying to cram too many things (tasks, obligations, distractions, etc.) into a relatively small space (24 hours in a day), it becomes obvious that we need to clear some clutter from our schedules. Mindful prioritization is the key. Pay close attention to all the things you do today – all the things you’re trying to fit into 24 hours. How much TV are you watching in the morning and evening? What websites are you browsing? What games are you playing? How much time are you spending texting, emailing, or updating your social media accounts? How much online window-shopping are you doing? How much time do you allocate to eating, cleaning, and taking care of others? What else are you spending the precious minutes of your day on? What you might notice first is that you’re doing too many random things that don’t need to be done – too many time-wasters. Then you might also notice that you’re overcommitted with too many obligations – and those obligations are filling up your life. You can start stealing your time back by eliminating as many needless distractions and obligations as possible, and saying “no” to new ones that arise. Easier said than done, of course, but the important thing to realize is that you CAN change how you allocate your time. Next, look at your to-do list (assuming you have one): how many of these things can you reasonably do in the next 24-hours? Probably only three to five, with sanity. Now ask yourself this: which task would you work on if you could only work on one task over the next 24 hours? That is your #1 priority. Just that one task. The truth is, you probably can’t complete everything on your list in one day’s time, and you can’t do your top three to five tasks right now. You can do only one thing at a time. So just focus on your #1 task and, once you’re done, then figure out what your next #1 task is. Clear everything else away, and focus. I really love chatting with people about what they enjoy doing and frequently they reveal what hidden talents they have. I met Karen Suttie some years ago whilst visiting at Armitage Aged Care facility. Karen works in the catering department and always makes sure I had a nice cuppa and a piece of cake. 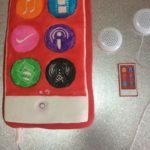 I knew Karen cared for her young grandson Jordan and during one of our brief chats she told me she was going to buy him an iPod for his birthday but, as a surprise, make a birthday cake in the form of a pad which appeared to be playing music. Karen says she is fairly new to serious cake decorating but likes experimenting and trying new techniques which makes it exciting. I think you will be amazed at how she got the cake to play music. First picture shows the cakes. Second picture was to show you that I drilled a hole in the cake board and threaded the speaker cords through ready for the cake. 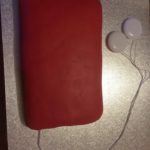 It also shows the bottom layer of the cake where I cut out a hole for the cords to go through to make it look ‘plugged in’. Third picture, I’ve put the bottom cake back on the rack and iced the two layers of cake together with a chocolate ganache. 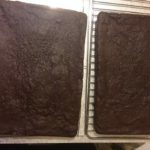 I iced them back on the rack so I wouldn’t make too much of a mess of my cake board. Fourth picture, a layer of red fondant. I cheated and bought ready coloured fondant. Fifth picture I had cut a rectangle of white fondant, put that on top of the cake and then had a go at drawing the designs from the home screen of an ipod. This was hard and I wasn’t very confident. 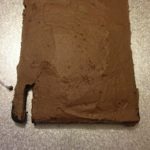 I used cake decorating textas to draw the designs and although they weren’t perfect, I thought they looked ok.
Sixth and seventh pictures – I did the screen background cover…..the worst part and the one that almost ruined the whole thing! I thought I’d try spray painting with cake decorating spray paint. Bad move! I got runs of paint everywhere. I decided to use a paint brush to try and even out the colour. I sprayed the paint into a container where I dipped the brush and finished painting. 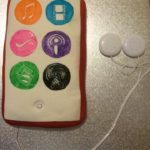 I also added a few details like the indented on/off button and I wrapped a little white fondant around the cords to make it look like the end of the cord at the plug point. I had also wrapped the two speaker cords together to make them look like one cord that split part of the way up, forming the ‘earphone’ look which I taped this to the board. 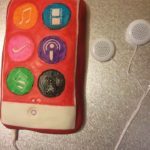 I taped my daughter’s ipod to the bottom of the cake board and with the help of a double plug jack, I plugged in the speakers to run music through the speakers so that it appeared that the cake was playing music. The two speakers were cheap $1.25 speakers that I got from China and the double plug jack was about $2.50, so the whole ‘real music’ look cost me a whole $5.00 but looked, and sounded, quite impressive. You don’t have to spend a lot to get a great effect if you know what to look for! 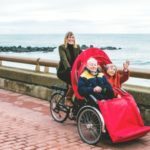 I recently became aware of a new program, Cycling Without Age, it’s not unlike the Community Visitors Scheme I volunteer with, however, instead of just visiting, the volunteers take their friends out for a ride on a specially designed bike rather like a rickshaw. The program was initiated in Denmark by Ole Kassow and now has licensees around the world including Australia and the UK. Of course Denmark is a bike riding country and very flat, so I am not sure how it will work in Australia plus there are bound to be lots of regulations to satisfy before it could get off the ground. Be inspired and uplifted by watching Ole Kassow’s YouTube video describing the scheme and the joy that is being given to residents in aged care facilities. 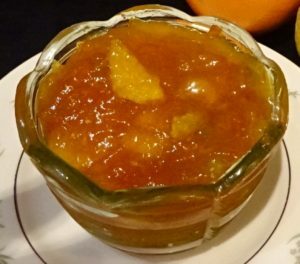 Making your own marmalade may seem a little old-fashioned or even a redundant skill but with my easy recipe, which I have used for longer than I care to remember, it’s a breeze. Seville oranges are the best oranges to use because they have such a tart taste and high pectin content but unfortunately their season is short here in Australia, only available during the first weeks of August. Not to be deterred any combination of citrus will do the job. 4/5 oranges, 2 lemons, 1 grapefruit, washed and cut into quarters. Remove pips and any discoloured pieces of fruit. Put fruit into a microwave safe bowl (I always use glass) and add a cup of water. Cover and microwave on high for 15 minutes. Let cool slightly then transfer to a liquidiser and pulse until the fruit still has chunks of rind. Alternatively if you want a smooth product continue to pulse. Place a large saucepan on your scales and pour in pulsed fruit, now add the same weight of sugar to fruit. Stir to dissolve sugar then boil rapidly for more or less 10 minutes, stirring frequently. I always put the saucepan on a trivet to save the marmalade burning. Test for set by putting a small portion on a cold plate and leave for a few minutes. If ready the marmalade will wrinkle when you push up with your finger. I like to pot my marmalade while it is still warm so I transfer from the saucepan into a large glass jug and then pour into pre-washed and sterilised jars. Seal immediately. This way the marmalade keeps really well. 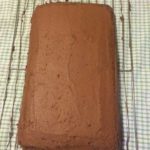 This entry was posted in Enjoying good company, Frienship, Interesting people, Recipes on July 10, 2016 by Janice Graham. Recently I have been thinking about what it means to be retired. Our generation is known for a strong work ethic, but I’m not sure we could keep up with some inspirational seniors, who still work full time even in their 90s. Apparently recent studies have shown that as you work past 65, your life expectancy increases. Here are the three not so retired retirees I read about recently. This amazing teacher really is 102 years old. In fact, she has officially been named America’s oldest living schoolteacher. Affectionately known as “Granny” by her pupils, Zhelesnik only began teaching at the age of 81 and still works 35 hours a week at the Sundance School in New Jersey. “I’m busy every minute,” she says. 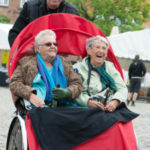 These three obviously really enjoy what they do, but likewise changing your lifestyle after retirement can open up new challenges and opportunities. Retirement doesn’t actually mean that you stop work, far from it. There is time to pursue those things you have had in the back of your mind to do if only you had time together with other activities you never thought it possible that you would enjoy or try. As we age everything has to be tailored to suit our abilities and needs, but through our local clubs, community houses, libraries, on line courses of every category etc. there is something for everyone to help you retire and enjoy to the full. More years ago than I care to remember, possibly in the 80’s during my alternative lifestyle era, I had a go at soap making. I recall writing to tell my mother back in UK all about it. I quickly received a reply from her saying that if I couldn’t buy soap in Australia, she would send me some. Anyway when I saw a Goats Milk Soap Making course being offered at my local Community House, I booked in. With all the so called “natural” soaps on the market, I had the mistaken idea that it was possible to produce soap without the use of lye, apparently not so, a fact the course leader acquainted us with at the start of proceedings. All real soap is made with lye (sodium hydroxide mixed with liquid). However with the chemical changes that take place during the soap making process, namely, saponification, the finished product does not contain lye. If you would like to know more about these facts, check out Wikipedia. I have to say it was a very enjoyable morning with much laughter and chatter. After having the process demonstrated, we were divided into groups of four, provided with the ingredients which consisted of goats milk, solidified oil, copha, vegetable oil and caustic soda (lye) plus our choice of essential oils, clays, colours or abrasives together with the necessary utensils, following which we set to work with varying degrees of success. So far I haven’t practiced at home. 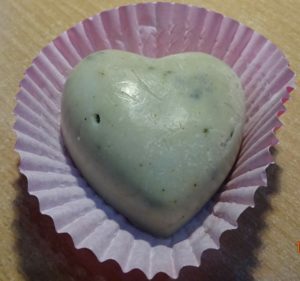 We didn’t add any colour other than clay during the course and I thought the finished product looked quite grey and uninteresting, although having used the samples we were given, the soap smells and lathers really well and is soft on the skin. I have written to the course leader to obtain some more advice. If anyone would like the actual soap recipe and instructions, I’m happy to send you a copy. Just drop me a line at sbf@dcsi.net.au. Having joined a Spinners group some months ago, I have been practicing my technique under the mentorship of Joan, a long time spinner with 15 years under her belt. I really do appreciate all her help and advice. In fact all the members of the group have been fantastic. Believe me it’s harder than you ever imagined. Having eventually got to the point where I could spin ‘reasonably’ well, I decided I would like to start from scratch, washing a fleece, drying, preparing for spinning (carding), then eventually spinning, plying and knitting a finished article to wear. Without going into too much detail, I thought I had the wool ready for spinning and took it to show Joan, who on inspection kindly said “it will make really good stuffing”. Apparently I had pulled the fleece in all directions instead of in the way of the staple (direction which the wool grows) which would cause lumps when attempting to spin a smooth thread. I had so much to learn. However, over the next few weeks I watched some YouTube spinning videos and saw one lady who spun absolutely anything and everything. Out came my wheel and ‘stuffing’ together with some bits and pieces of coloured wool my friend brought back from Chile and I set to work. Yes big lumps and bumps did emerge, breakages frequently occurred, but undaunted I spun on and eventually had enough to make a small circular scarf. Here’s my finished article which I’m quite proud of and wear frequently. I was reading an article recently about the varied uses of Cream of Tartar and thought I would share a few of them with you. I realise of course that you may already have them in your repertoire but if not you may find them useful. Make a paste of cream of tartar mixed with lemon juice to lift stains on clothing and carpets. Let the paste sit for an hour or two, then either machine wash as usual, or blot with a damp cloth. This mixture works well on ink stains! Clean stains and residue out of your coffee pot by sprinkling cream of tartar inside. Add boiling water to fill the pot, let the pot cool to room temperature, and rinse well. Make homemade playdough by mixing 1 cup of flour, 1 cup water, 1 cup salt, 1 tablespoon vegetable oil, 1 tablespoon cream of tartar, and 3-5 drops of food dye (optional). Add more flour if the mixture is wet or sticky, or add more water if the mixture is too dry. Add an 1/8 teaspoon of cream of tartar for each 2 egg whites in your meringue. The acid from the cream of tartar will stabilize the egg whites and add volume to your finished product. I’m going to finish this post with a happy story. 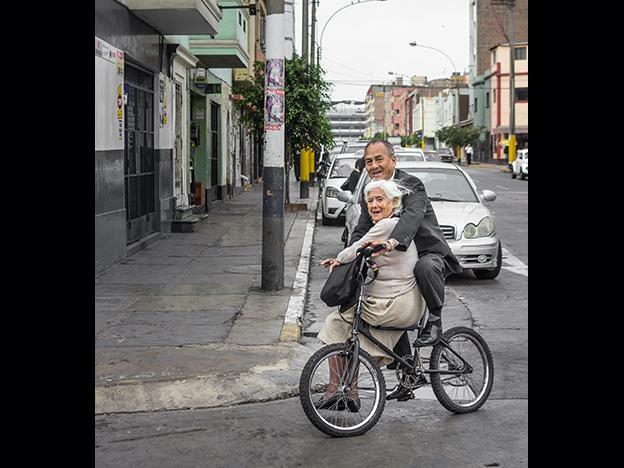 I can’t imagine riding around a busy city like Lima in Peru on a bicycle but what fun – enjoy. On May 23, 2016, photographer Jean Paul Merino posted photo to a Facebook community page for aspiring and professional photographers. Today the photo, titled “Tercer Juventud” (Third Youth) has over 1,000 ‘likes’. Here’s the photographer’s story behind the spontaneous image that would capture hearts (and thumbs up) around cyber space. I was heading for the center of Lima on my bike, and suddenly I crossed paths with an elderly couple enjoying a bicycle ride. They were both laughing, and it caught my attention. So, without thinking twice, I pursued them for what would be 3 blocks in order to capture the scene, and waited on a corner with my camera and backpack for that shot. I published the photo on my Facebook group, Peru StreetPhotography …[and] a week later, a Ms. Anita Navarro wrote me, congratulating me for the photograph. She said she was the daughter of the woman on the bicycle. Then, she continued to tell me the couple’s story: The man is the husband of her sister, who died 14 years ago. He was left alone with their four daughters, so Anita’s mother stepped in to help raise the girls. The man never remarried. The family has told me the couple likes the photo and have no problems with my having posted it on social media – to the contrary, they are quite pleased. I plane to give them a copy of the photograph. 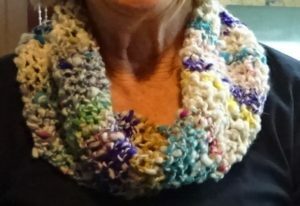 This entry was posted in Enjoying good company, Interesting people, Joining a Club, Knitting and crafts, Projects, Recipes and tagged MM on June 11, 2016 by Janice Graham. I’ve previously mentioned my local Neighbourhood Centre (Mitchell House & Harvest Centre, Wonthaggi) where you can access a wide variety of courses. 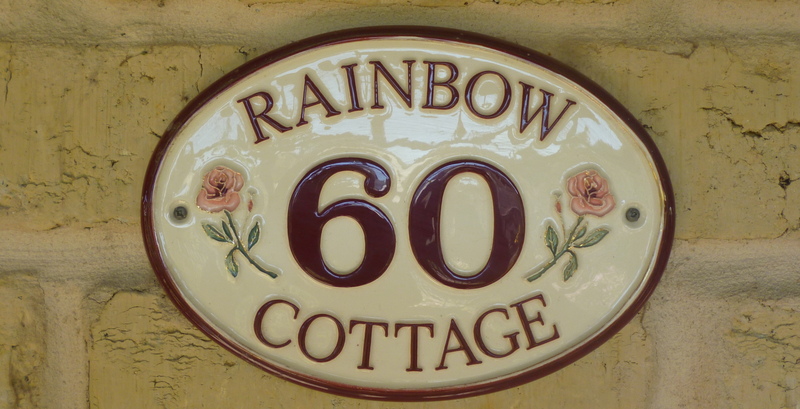 Neighbourhood Houses began in the 1970’s with people coming together to share their knowledge and skills with each other at low or no cost in a process called LearnShare. LearnShare recognises that throughout our lives whether working with our hands, our head or our heart, we all acquire valuable knowledge and skills. As part of the ongoing process of lifelong learning we can all learn something new or share what we know. This week I offered my knowledge of vegetarian cooking in a LearnShare program. It was a great experience made even more rewarding by the enthusiasm of the participants. I would urge you to seek out your local Neighbourhood House to enjoy good company, learn new skills or volunteer to share your own experience. 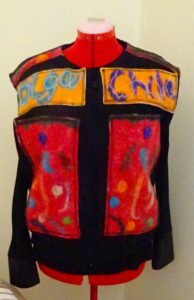 In my blog of 2nd February 2016 I talked about the project I was undertaking making a felted jacket from wool my friend Olga brought back from Chile. At one stage I thought I had taken on more than I could chew. It’s one thing having the idea of what you would like to do and actually putting it into practice. Once started I realised that the jacket needed to be lined, another challenge. Olga found a length of lining in a local Op Shop for $2.00; a great bargain. The project is now a reality and whilst by no means perfect in every detail, Olga now has a very unique reminder of her trip home. 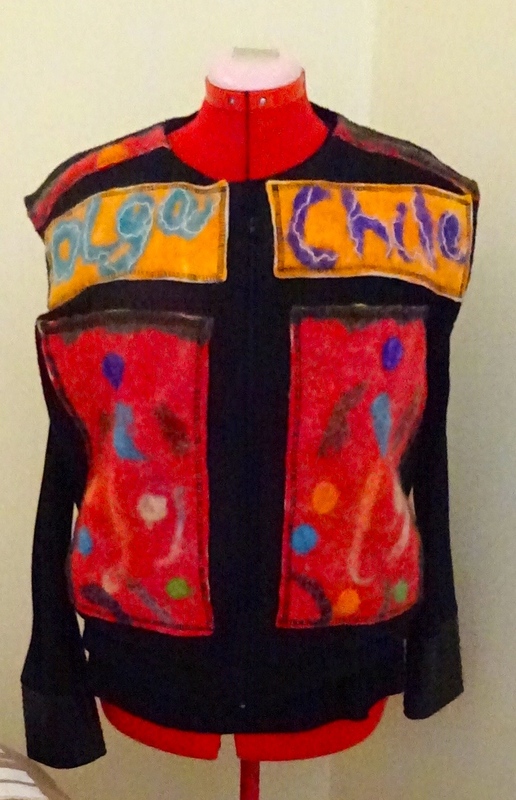 Here the jacket is modelled by “Doris” my dressmakers dummy. It has a zip-up front which is not visible in the picture. I still have wool over and hopefully one day will manage to make a jacket for myself. I’ve made up a couple of sample panels though I don’t think it will be quite as elaborate as Olga’s. We will see. Sophia my little terrier met up with her doggie boyfriend Oscar yesterday at the Powlett River. They had great fun running on the beach and scampering in the sea. Oscar is becoming very responsive to a training whistle – he has a tendency to investigate the bush and sometimes doesn’t return for over an hour. 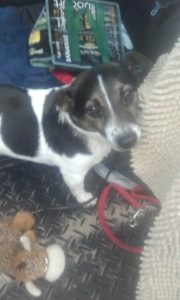 Sheri, his owner, told me that with the aid of this recently acquired whistle and a treat he now returns promptly. Truly amazing as in the past she has had an hour or so wait for him. She used it during our walk when Oscar periodically went missing, so I saw the results in action. I checked out Rufus and Coco Dog Training devices on the internet at www.petology.com.au so you might like to have a look for yourselves if you have a need for this idea. Sheri also uses a Soggy Doggy Drying Blanket when she gets Oscar back to the car. I really must get one of these for Sophia as she often needs a rub down after a walk or swim and it does save a mess in the car. Again I looked on the internet where there are various companies offering these blankets at different prices. Here’s Oscar in the back of the car accompanied by his mascot, being dried after a swim with the Soggy Doggy Blanket. I think we all have a lighter step when we leave the hairdressing chair; I know I do. 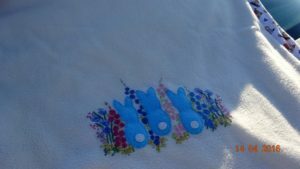 This entry was posted in Dressmaking, Enjoying good company, Frienship, Interesting people on May 5, 2016 by Janice Graham. I first met Noelene last year at a Moviemakers Club Meeting and having previously been told of her interest and knowledge of cemeteries, asked if she would be able to spend some time with me chatting about her cataloging work (as mentioned in a previous blog post). 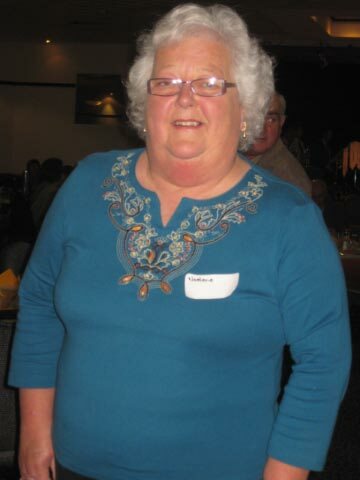 Last week I was fortunate enough to spend three hours with Noelene during which time I was absolutely amazed by her knowledge of both cemeteries and genealogy together with many other activities with which she is involved. I started the conversation by asking Noelene what sparked her initial interest in cemeteries. She told me that as a child her parents went on regular picnics and during these trips they usually parked close by a cemetery and walked around. 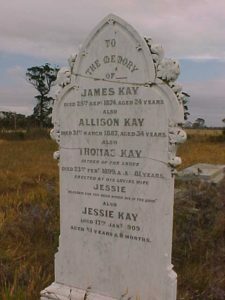 It was not until she was on her honeymoon in Port Campbell (a coastal town in Victoria Australia) that her interest was reignited when she decided to wander around the local cemetery. Although life was very busy during the following years, raising children, running a business with her husband and caring for other family members, she said she still took time out to wander around a cemetery. 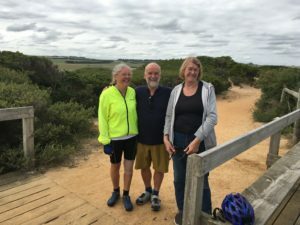 Unfortunately her husband had a very bad car accident which left him with some disability so that’s when they decided to move from Melbourne to their present location in Inverloch a seaside town in Gippsland, Victoria. In 1990 Noelene said she was left alone at home with her dog, the children were all at school, her husband was working part time and she felt at a loss. After working for many years and now semi retired she asked herself “what to do”. 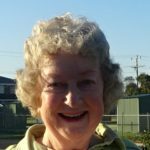 She started taking an interest in the history of the local area and became involved with the starting of Wonthaggi Genealogy in 1997 helping catalogue the resources of the area, its schools and shops. 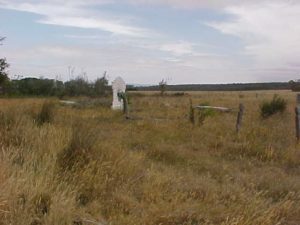 She found that there had been 18 cemeteries which fell into three groups, Private Cemetery, Old Cemetery and current cemeteries. Noelene studies burial registries, copies to a data base and takes photos. 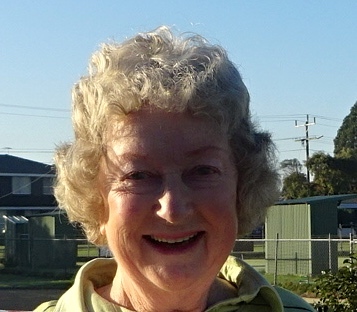 Eventually she was tracked down by the Cemetery Trust Group of Melbourne and asked to provide the history of the area which she has been doing. 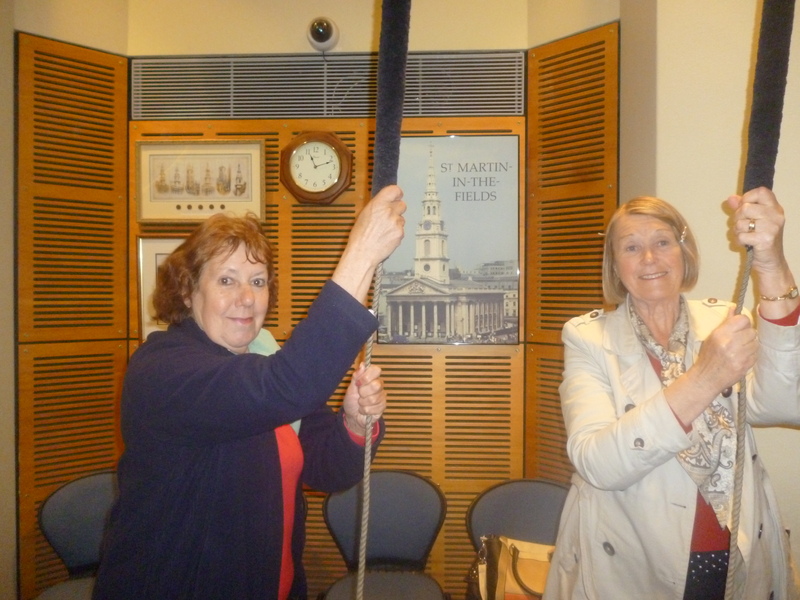 Noelene provided me with detailed information about her work which I found fascinating. 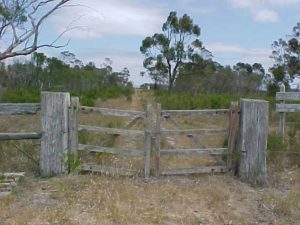 For example sometimes she has to walk through paddocks and rough ground to locate an old cemetery, not in summer she said for fear of snakes, to take photos and document burial sites as shown in these photos of of Woodside Cemetery, Yarram, South Gippsland, Victoria. She also explained what happens in the case of a property that has family burial sites. 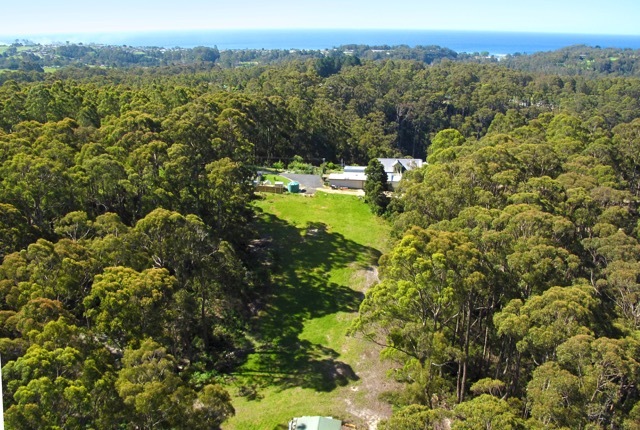 It is possible for the property to be sold but an area of an acre remains around the burial and is the property of the original family or their heirs. which is a map of the rows of graves. She documents the plots that have names, then photographs the rows of graves following which she views the photos and compares the Burial Registry and makes comments. Noelene says it’s like a huge jigsaw. 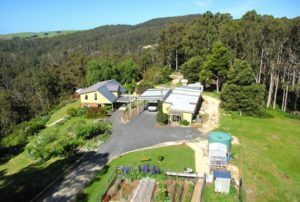 In addition to all this work Noelene runs workshops to help people find a relative who may have been a convict transported to Australia, continues her work documenting historical schools and is presently recording details of the history of Wonthaggi State Coalminers. Apparently there are many photographs of these miners but no details of who they are. A campaign is being run in the local papers to see if anyone can identify them. If all this isn’t enough Noelene helps people with their family trees, provides a Computer Tutoring Service for 50+ age group and pursues her hobby of locating and selling collectables like salt and pepper pots, teapots and money boxes. At 65 Noelene, who now only has one kidney and suffered ill health for a couple of months last year, is a wonderful example of what one lady can achieve. You can contact Noelene by e-mail if you would like to seek her help at noelene@dcsi.net.au. 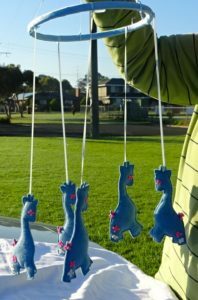 What a truly wonderful gift this mobile will be for Rhonda’s niece when she finds out her mother made these giraffes and now she has them for her baby. You simply won’t believe how creamy and ice cream-like this dessert is. Recipe only works in a food processor. Method: Peel bananas and wrap with plastic food wrap. Freeze for several hours. Chop bananas into a food processor. Process until creamy, stopping and scraping down the sides occasionally, then add honey and blend through. Serves 4. One of the most sincere forms of respect is actually listening to what someone has to say. This was brought home to me the other day when I was trying to get some information and the person I was talking to had absolutely no interest in what I was trying to say. I came away very frustrated. Is this happening to you or do I need to upgrade my skills of communication? This entry was posted in Enjoying good company, Frienship, Interesting people, Joining a Club, Knitting and crafts, Recipes on April 17, 2016 by Janice Graham.